Download Hero Exporter: The latest Hero Tools and Exporter scripts can be downloaded via account.heroengine.com and clicking the "All Downloads" tab. 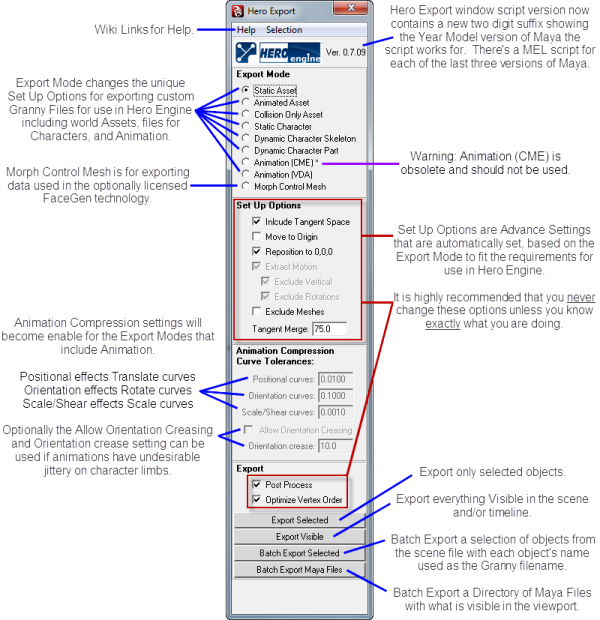 3ds Max: Instructions are found on the Setting up 3ds Max page. Maya: Instructions are found on the Setting up Maya page. In 3ds Max, the Hero Export panel can be accessed on the Utilities tab panel, by clicking the MAXScript button on, then from the Utilities drop down menu, select "Hero Export". If this does not show up, see Setting up 3ds Max. In Maya, the Hero Export window can be accessed via the Export icon on the HeroTools shelf. If missing, see Setting up Maya. Static Asset export will include meshes, materials, and texture references in the mesh file. This type of export is used generally for non-animated objects such as props, terrain and architecture. Note: When exporting multiple objects at once, be sure to group them together before exporting so that they'll be interpreted as a single mesh in the HeroEngine. Multiple separate meshes contained in a single file will result in errors. Animated Asset export will include meshes, models, materials, texture references and animation in the file. This type of export is usually used for simple animated objects that don't require AI. Character export will include meshes, models (including bones comprising the animation rig), materials, and texture references in the file. 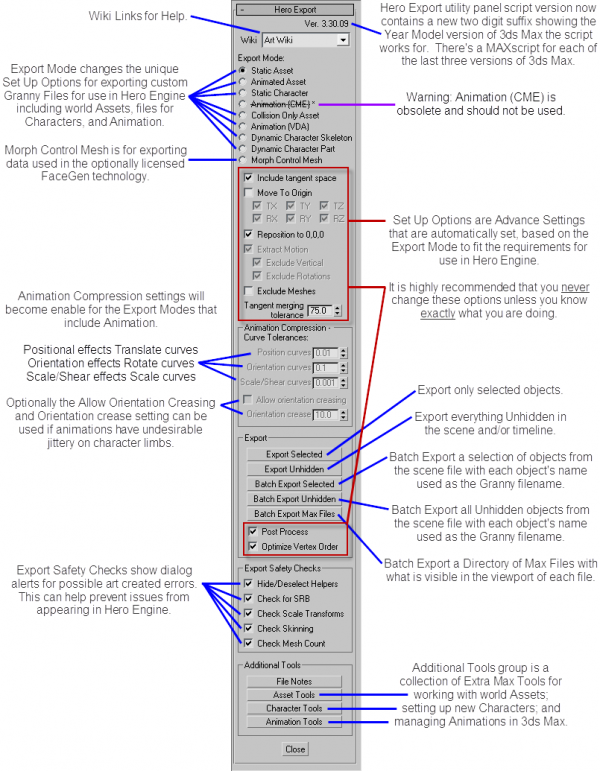 WARNING: The HeroEngine does not use/support the Constant Motion Extraction (CME) animation export mode settings in current versions of the Engine. The Collision Only Asset export includes only mesh data in the export resulting in a mesh which is invisible in the HeroEngine, but which can be used for creating such things as collision cages and invisible barriers. Animation VDA export includes only animation data in the animation file to be wired to a Static Character mesh or Dynamic Character skeleton. This is the most common form of animation exporting. The Skeleton(Max) or Dynamic Character Skeleton(Maya) export mode is designed for exporting animation rigs (either Biped, Max bones, or a combination of the two) and will include only rig data in the export. The meshes for a Dynamic Character are to be exported separately as Dynamic Character Parts so they can be fitted to the Dynamic Character Skeleton as needed. Dynamic Character Part exports will include only mesh and texture reference data in the file. Dynamic Part files are swappable parts that fit to a specific Dynamic Character Skeleton. Morph Control Mesh is similar to a static asset export, except that it adjusts a few options that are specific to the FaceGen pipeline. This mode is used when exporting objects that are going to be used as control meshes in FaceGen customizer. These checkboxes are Advance Settings that are automatically set based on the Export Mode to fit the requirements for use in Hero Engine. It is highly recommended that you never change these options. The lower the number the more accurate the translate motion, but leads to a bigger animation file. The lower the number the more accurate the rotation motion, but leads to a bigger animation file. The lower the number the more accurate the scale motion, but leads to a bigger animation file. Turning on this check box enables Orientation Crease. See next option for more info. This uses sharp creasing to better fit the motion. It is sometimes used to correct limb jitter. Export Selected will export only selected objects according to the selected export mode. Export Unhidden for 3ds Max and Export Visible for Maya will export only unhidden objects in a scene according to the export mode. Export all of the selected assets to a directory. "LOD" objects and "Occluder_Only" objects will be grouped with the appropriate object on export. Object names are used of for the exported file name. Batch Export Unhidden for 3ds Max exports all unhidden assets in a scene to a directory. "LOD" objects and "Occluder_Only" objects will be grouped with the appropriate object on export. Object names are used of for the exported file name. Export all 3ds Max or Maya files in a directory. Files within the directory must be of the same type for the export mode being used. What is currently unhidden/visible in the viewport in the scene files will be exported. Files should be ready for export before using the Batch File Export. For 3ds Max, there are a series of safety checks that allow the exporter to check for things that are required for export. They will only notify you if something isn't correct, however the export will continue. You can turn these off by using the check boxes. Maya currently does not have any error checks. If errors happen to come up in your art pipeline between Maya and Hero Engine, please contact your support list. Textures must be dds files, and the texture path is relative to the model path. So if your model is in .../MyComputer/MyArt/MyModels/ and your texture is in .../MyComputer/MyArt/MyTextures/, your model now knows where to find its texture. When you upload it to the server via the repository browser it will then look to find its texture in the same relative path. So you would need to upload your model to .../MyRepository/MyArt/MyModels/ and you would need to upload your textures to .../MyRepository/MyArt/MyTextures. This is why we have the concept of the Art_Depot. But if you get confused, just put all your models and textures in the same folder on your local machine, then have them all in the same folder on the server, until you get your feet wet. There are two special exceptions to "put your stuff anywhere". The select terrain texture dialog looks in \World\LiveContent\TerrainMaps\ and its sub-directories for terrain textures. Make sure to add your terrain textures there, or they will not be found by the select texture dialog. And Dynamic characters must have the Character\Dynamic_2 folder as their root. It is required that character files go inside the Character/Dynamic_2 folder, but you may create subfolders in anyway you like.